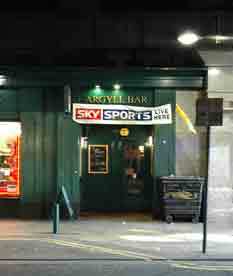 259 Argyle Street, Glasgow. G2 8DL. Tel: 01412212914. This old pub has been known under many different names in the last ten years. Caricature's, Argyle Bar. It was originally called the Central Bar owned by Alexander Graham a prominent city Wine & Spirit Merchant who owned other premises in the city including Oxford Street, Cathedral Street and Crown Street. Alexander was one of the original members of the Kareless Klub, a friendly organisation of trade licensee's. When he died in 1900 the pubs were run by John McAulay as trustee then Thomas W Lang took over the running of the business. In 1950s Robert S Lang was licensee, he continued as the licence holder until the 1970s. It is interesting to note that Thomas W Lang was one of three brothers who started business in 1861 at Oswald Street and founded the firm of Lang Brothers. In the 1970s this old Argyle Street local was called Bubbles. 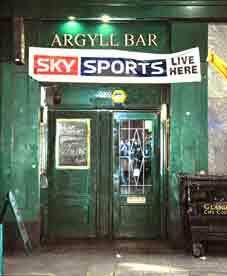 The pub is now called the Argyle Arms.